“While it’s heartening to see the public react against this transphobia, the fact that intelligent and educated people are still recycling transphobic discourse tells us that we are not at a place of full acceptance or equality for trans people yet,” Dundas said. Dundas worked for an NHS gender identity clinic for eight years before moving into independent practice in May 2018. In the same year, he was honoured in the BPS’s annual awards for his commitment to his patients. Dundas added that while transphobia “will reduce naturally with time,” and trans people are increasingly protected by law, gender specialists and psychologists can help by advocating for trans and gender non-conforming people. “I believe that education is key, and should continue to take place in many of the institutions where trans issues are negotiated, for example, education, medicine, the workplace and the law,” he said. In the UK, transgender people are protected by the Equality Act. They should be able to use the correct bathroom, be recognised at work as their gender, and access any appropriate public services anywhere in the country. However in practice, many trans people are discriminated against. 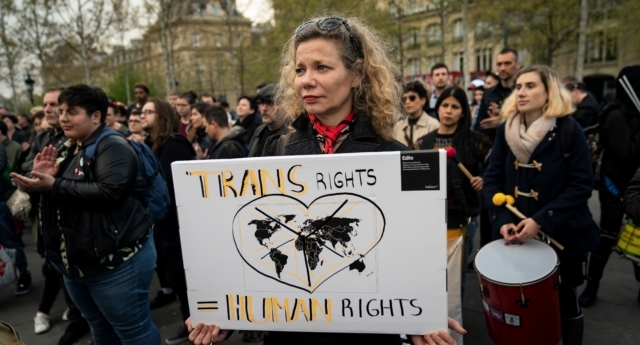 In a 2017 report, Stonewall found that two in five transgender people had experienced a hate crime or incident because of their gender identity within the past 12 months. The Home Office found that 1,651 trans people experienced hate cries in 2017/8, but it is thought that the true number could be five times that due to underreporting. It is also worth noting that transphobia is not limited to violence or aggression. Deadnaming—referring to a trans person by a former name, typically one that relates to the gender they were assigned at birth—is a common experience for most trans people which is considered transphobic. Transphobia is also something experienced by trans men. In a recent episode of PinkNews’ First Times, six trans men opened up about their experiences of discrimination, including online trolling and being outed.